Were you looking for Huragok, a species often known as Engineers? ENGINEER-class Mjolnir is a variant of the MJOLNIR Powered Assault Armor [GEN2] manufactured by Lethbridge Industrial. The Engineer helmet has a quad-set of spectrum nodes that loosely resemble Huragok eye placement. It also has an assessment locator (LW-210) that is used to lock onto machine irregularities. The helmet has a microframe embedded in it that supports concurrent AI shards with limited remote control of limbs and suit controls. The chest has a componential shield redistributor cartridge mounted onto the collar for easy modification. The reactor pack has a pack-mounted release grip to govern energy re-appropriation. Late into the Human-Covenant War, Covenant assets in the field were instrumental to this variants early designs. Manufactured by Lethbridge Industrial, it was tested at Lethbridge Combat Fields, and was first deployed during the expedition of the volatile moon of Thales. It is designed to facilitate the "subversion, repair and reconstitution" of a wide range of technology, including Covenant and Forerunner. 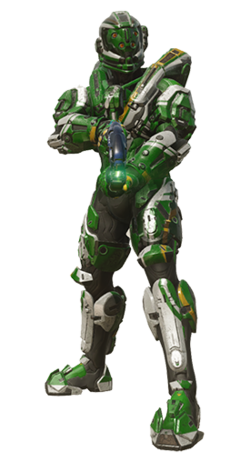 This armor also serves as a testbed for numerous netwar-specific subsystems that target Covenant and Forerunner battlenets, security command protocols, and hardware interlocks. The Engineer variant was used on Thales to halt the criminal activity in the colony's docking complexes. It was also used during Spartan-IV operations on Requiem. It is considered the rarest combat armor system in UNSC service due to the fact that there are only a handful in operation at any given time. Despite its purpose, Engineer was impressive in combat. Default unlock: Obtained by achieving Spartan Rank EN-4. Edge unlock: Obtained by achieving Spartan Rank EN-9. Description: First introduced into combat theaters towards the end of the Thales expeditions. Helmet description: The microframe embedded in the ENGINEER helmet supports running multiple concurrent AI shards with limited remote control of limbs and suit controls. Body description: ENGINEER-class armor serves as a testbed for numerous netwar-specific subsystems that target Covenant and Forerunner battlenets, security command protocols, and hardware interlocks. Specialization chart showing the Engineer armor along with variant. Another view of the Engineer armor. Engineer as seen in Halo 5: Guardians.